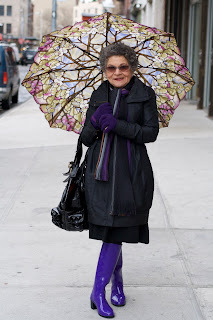 This great picture is among the latest posted by New Yorker Ari Seth Cohen on his Advanced Style blog. He roams the streets "looking for the most stylish and creative older folks". "Respect your elders," he urges. "Let these ladies and gents teach you a thing or two about living life to the fullest. Advanced Style offers proof from the wise and silver-haired set that personal style advances with age." His photographs prove the claim. Look at those boots, that brolly, that pose. "Style," he told a BBC interviewer, "is a reflection of personal vitality." Older women, unlike younger, dress to please themselves, he said; they throw away the rules. He's working on a book of his photos and subject's comments to be published next year. Thanks to Cheryl for bringing Cohen and his blog to my attention. And thanks to him for being smart enough to shun the "youth is best" obsession. That's brilliant. I'm working on making up for the sobriety of my youth in a small way already, I feel I need a good run at it.